Just a little belated reflection here on Oliver’s Valentine’s Day. 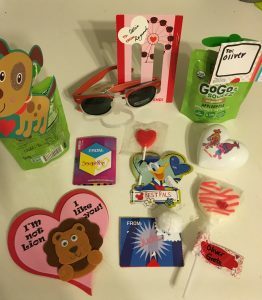 I’ve never been a huge fan of Valentine’s Day myself, but nothing like having a kid to really change your perspective on certain previously unacknowledged holidays. 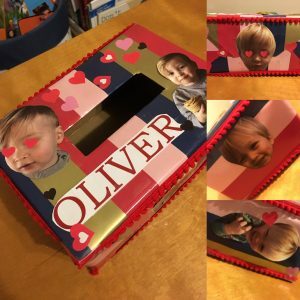 This was the first year Oliver had a Valentine’s Day party at daycare and the children created little mailboxes and exchanged cards/treats. 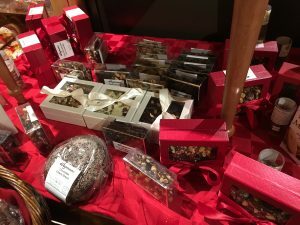 Holidays that focus on food or goodies can be a little challenging and I do find myself vibrating at a bit of a higher stress frequency (higher than normal, that is). But I was surprised by the number of treats Ollie received from his friends that did not involve something I needed to hide away from him. Even the treats that involved something edible were mostly safe for Ollie to eat. I have been meaning to ask his teachers if they had given the other families a heads up on his restrictions or if it was all a coincidence. Either way it was a really pleasant surprise to let him enjoy all of the treats his friends were thoughtful enough to give. 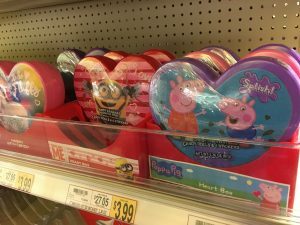 While I was out shopping around for something to go along with his Mickey Mouse valentines (we finally settled on Annie’s Organic Bunny Fruit Snacks, I came across a lot of fun items that were galactosemia friendly, for kids and adults. Wegmans had these beautifully packaged dark chocolate mixed nut barks that I would not recommend for a two-year old, but I would really enjoy it. Only the dark chocolate option was dairy-free. 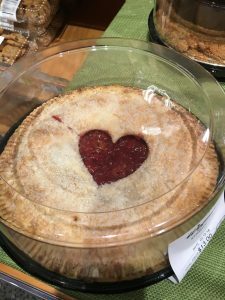 They also had a really cute cherry pie with a heart cutout that I could easily eat in one sitting. 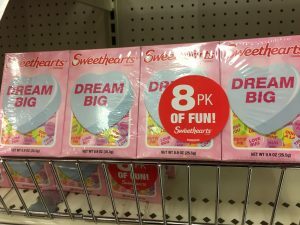 Of course, the holiday section of Target had a wide variety of dairy-free or non-edible valentine items. 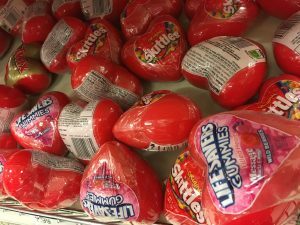 I love that some companies are now offering something other than chocolate in the traditional heart-shaped box. Not all of these options were age-appropriate for our toddler, but it’s nice to have an idea of what we can start to do as he gets older. And, although we didn’t make it down to Lititz to visit my new favorite semi-local bakery, Sugar Whipped Bakery, they posted these AMAZING looking vegan/gluten-free cookies! I think they are just the cutest. Follow them on Instagram (@sugarwhippedbakery) or just stop in to see what they have available for the dairy-free/vegan/gf folks, in addition to their regular baked goods. Seriously, I’m in love with them. Inevitably when one of these holidays or events passes, whether it has gone really well or we faced some tough realizations, John and I find ourselves looking toward the future. Will things go this well when he’s three? When he’s ten? What happens when he’s a teen and has to make good decisions on his own? I suppose this is true with most parenting wins or losses, but we still worry and we keep pushing forward, caught off guard sometimes by how the things that felt insurmountable in theory (constantly checking food labels, worrying about his childcare, challenges in his development, etc.) have actually been a lot easier to navigate so far than we thought. We try to remind ourselves of the little triumphs when the chips are down, and we are counting this V-Day as a victory for little O.